In Super Turrican you are Bren McGuire, on a United Planets Freedom Forces mission to save the peaceful planet Katakis from the Machine, source of all that is cruel and evil in the universe. 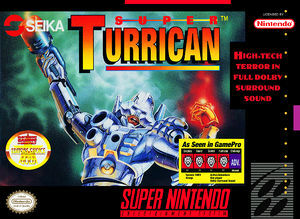 The only weapon on your side is the state-of-the-art Turrican Assault Suit. Equipped with multiple weapons, including the incredible Freeze-Beam that temporarily immobilizes almost any enemy, the Turrican Assault Suit gives one man the power of an entire army. The graph below charts the compatibility with Super Turrican since Dolphin's 2.0 release, listing revisions only where a compatibility change occurred. This page was last edited on 21 February 2018, at 03:18.